Hey it’s the first friday of October, ready for another episode from The Beer Snobs. 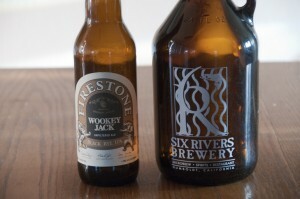 On this episode we try Firestone Walker Wookey Jack and Six Rivers Brewery Chile Pepper Ale. Posted in Blind Taste Testing (2011 - 2013) and tagged Chile Pepper Ale, Firestone Walker Brewing Co., Six Rivers Brewery, Wookey Jack.